Do you want your workers to act and feel like professionals, or DIYers? Cut down lost time and tools with A-Mezz tool cribs. A-Mezz can help you increase productivity and decrease waste with our lockable wire parts lockers and tool cribs. Made of high strength welded wire, our secure storage options will save you time and money and make your shop look more professional and clean. Why are lockable tool cribs important? There is nothing worse than being in the middle of a project and realizing someone walked off with the tool or parts you need. While your productivity was at its peak, you had to stop what you were doing and locate the missing items. Lost items that aren’t quickly found need to get replaced, causing you to waste even more time – and money – going to the store or searching the web to source the replacements. If the replacement tools or parts are not readily available you then have to table the in-process project until the replacements come in, greatly increasing the chance for additional components to get misplaced. A lockable tool crib is a must to ensure your workers have what they need, when they need it. 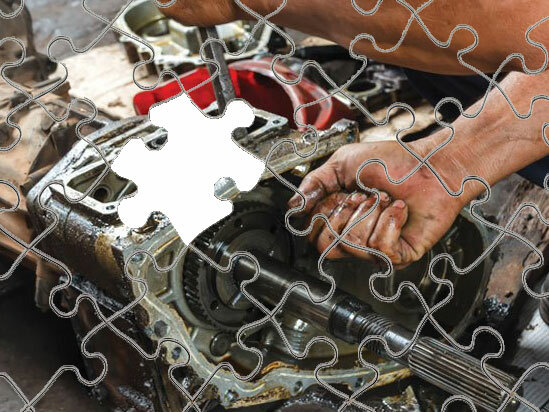 Expensive tools will stop going missing – either through misplacement or employee theft. You will spend less money replacing items, spend less time looking for items that “walk away”, and spend more time making money. 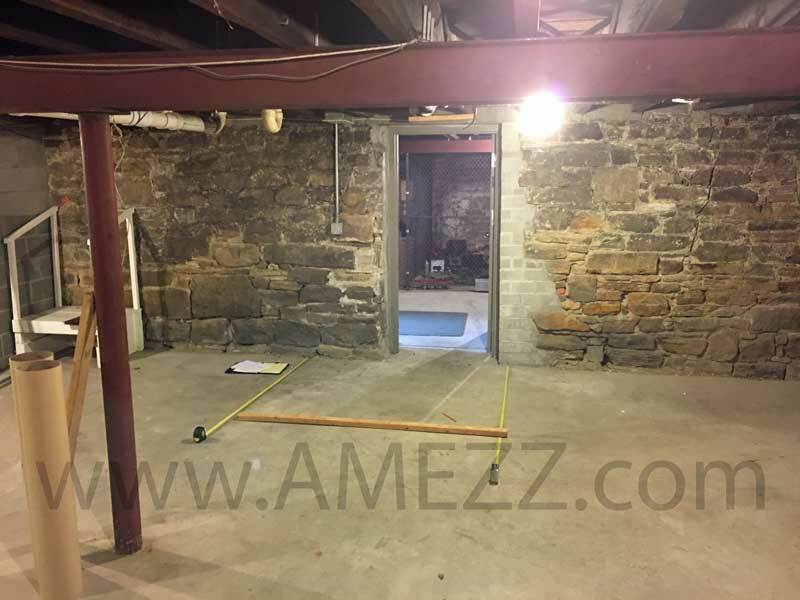 A-Mezz can help you configure a layout that works for you and your site. We can supply small multi-tiered lockers for parts and tools all the way up to large tool cribs. Pretty much anything is possible. There are available sliding doors, hinged doors, service windows, electronic keypad entry systems, keycard locking systems, padlock hasps and cylinder locks. If you have a special lock you prefer, such as one tied to a facial recognition system, we can supply an electric strike on the door to tie into your system. My install location isn’t standard shaped/sized – can I still use a tool crib? The great thing about tool cribs is that there are no rules. Size is whatever you need and they can go literally anywhere. We have installed lockable parts storage for maintenance and tool cribs above mezzanines, below mezzanines and out in the middle of shop floors. Contact A-Mezz and let us help you increase productivity and increase your margins by decreasing waste and project hours. 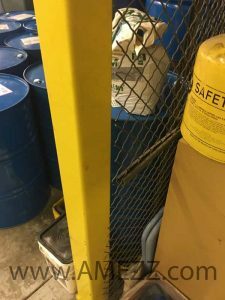 This entry was posted in security, wire partition and tagged maintenance, parts locker, tool crib, Wire partition on February 25, 2019 by Brett. 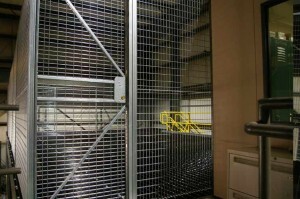 We were called out to a site that needed a lockable wire partition in their facility. 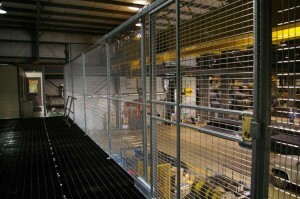 The wire partition needed to split a long, below grade area into two secure and separate partitions. Access to a common entry door and light switch needed to be maintained. 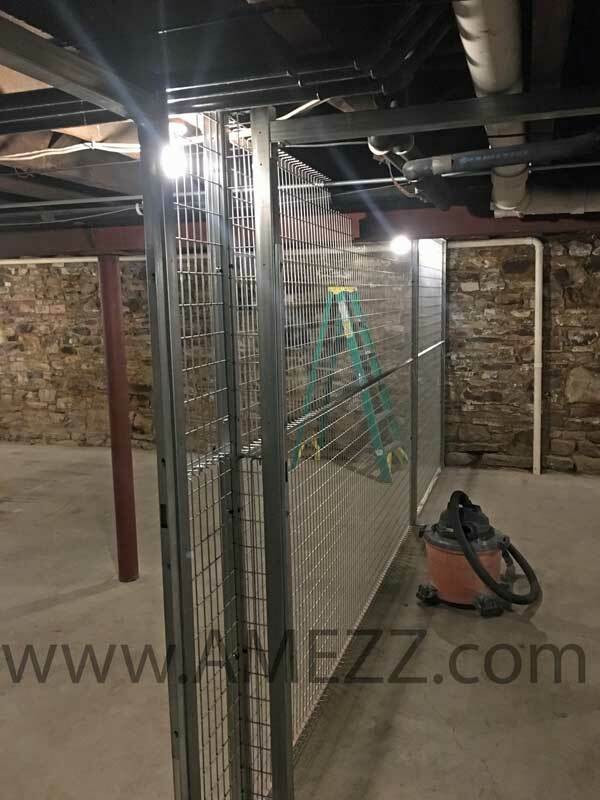 The location also had low, uneven ceiling dimensions due to obstructing support beams, conduit, gas lines, etc..
Our welded wire partition system was perfect for this project. Other framed woven and welded systems need to have a custom, factory made panel with exact, framed cutouts. Those require additional engineering costs and manufacturing costs – due to custom setups. They also often have higher material costs as the panels need to have a post at each side of the obstruction to support the custom panels. A-Mezz welded wire partition allows for cut-outs where necessary to work tight around existing obstructions. A-Mezz’s welded wire partition systems feature an unframed, 8 gauge galvanized welded wire panel. The panels are able to be trimmed to length, eliminating the need for custom sizes. This saves on the additional costs associated with doing a one-off on the manufacturing line. The panels can also be notched out around obstructions. This allows a tight, clean look while also providing flexibility in the field to deal with known (and unknown) obstructions. Cutting a woven wire panel will leave a jagged, unraveling edge. Not only is it not a clean look, but it is an easy way to have a workplace injury if clothing snags on the unraveling wire or an employee is cut by it. When we arrived with material for the install, the first thing we did was lay it all out and double check our interferences. The critical locations were all marked – clearing the light switch and ensuring doors are installed where the floor was flat enough to swing freely. With the hump in the floor ensured that we had enough sweep (clearance under the door) to clear the hump, as well as enough overhead clearance to miss any of the low overhead obstructions. With our layout all marked we worked from the critical locations out to ensure there would be no issues. A crew of two was able to complete the install in less than a day. This included all of the cut-outs required for a tight fit. The end result was a clean, secure wire partition that allowed the customer flexibility with their open space. 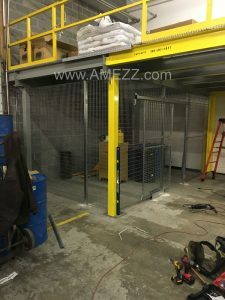 Whether used for a tool crib, tennant storage, or machine guarding, A-Mezz can supply you with our welded wire partition, giving you the flexibility of a totally customized system at a much lower price. 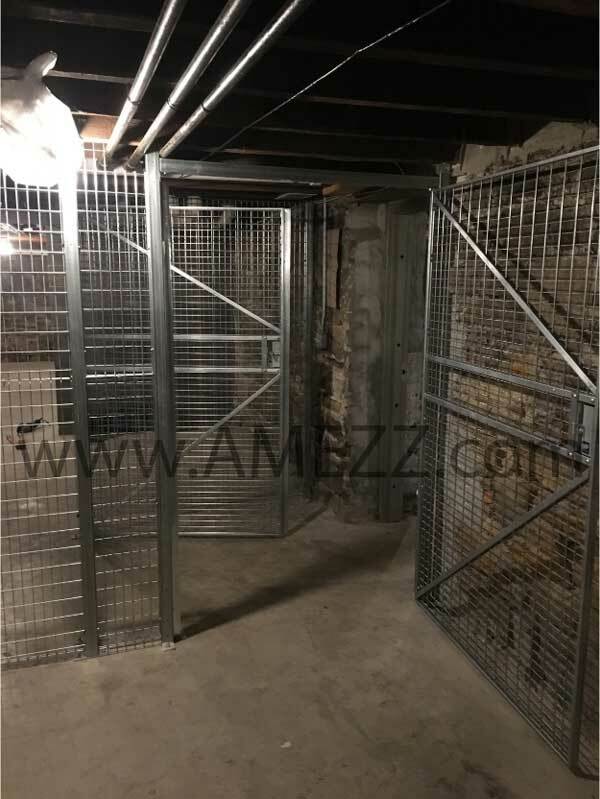 This entry was posted in wire partition and tagged welded wire, Wire partition on December 31, 2018 by Brett. This is a project we completed in NE Ohio. The customer was looking for space for a secure tool crib for maintenance storage as well as the flexibility to store product. 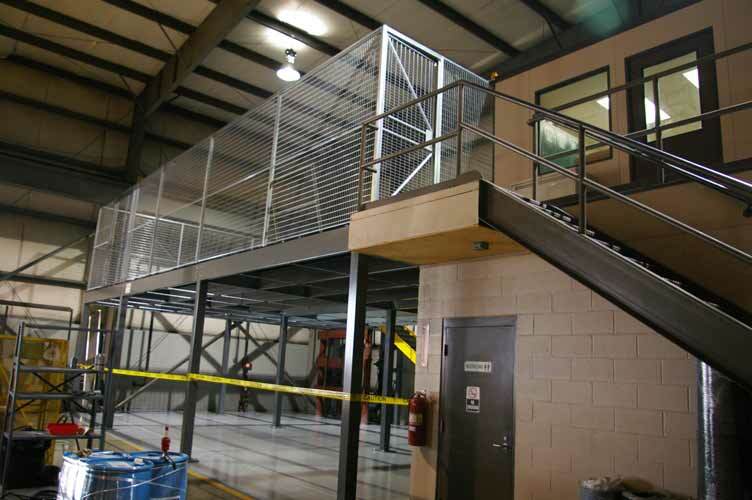 As the product was quite heavy, we utilized the ground floor portion for storing those items and used welded galvanized fencing above to secure their maintenance department’s tool storage. 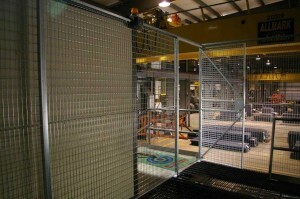 The welded wire fencing was selected because of its versatility. 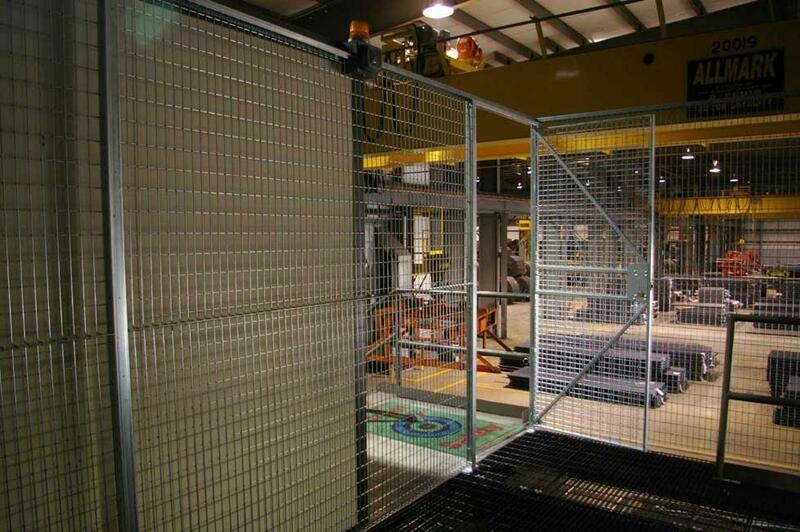 Welded wire partition panels have a weld at each intersection of the wire. In contrast, woven wire generally has the individual wires woven and tied off or welded to a fence frame. The welded wire option is great for most jobs because it can be cut to size in the field. If you measure inaccurately, it is not the end of the world because you can trim the extra length off the panels. 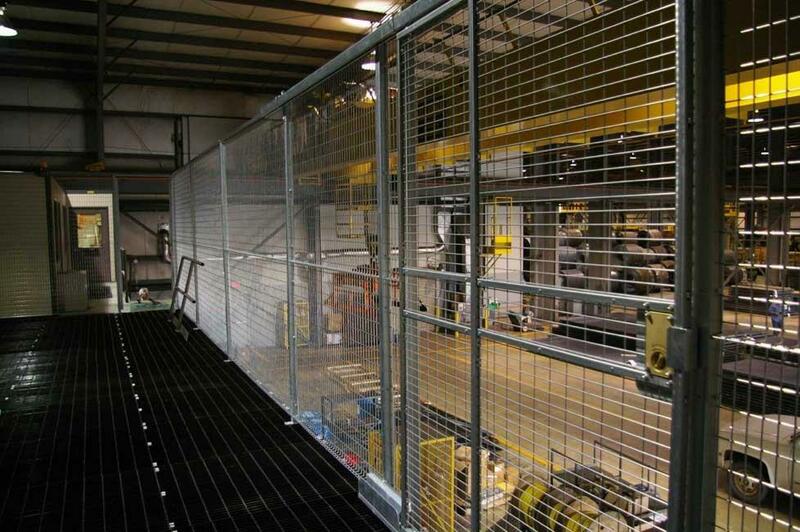 Likewise, if there is piping or beams running in the way it is easy enough to cut the welded wire fence panel to accommodate the obstruction, while still maintaining the wire partition panel’s integrity. We utilized the existing stairs and landing from the building adjacent to the new crib in an effort to cut down cost and avoid taking up more room than necessary on their plant floor. The light you see is a reminder light for the operators of the adjacent crane. It reminds them that the mezzanine and tool crib are there so that they don’t bring their load all the way back to the stop and potentially come in contact with the new structure. 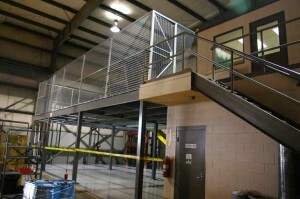 On the front side of the mezzanine, a sliding door was in place for the occasional pallets of materials for maintenance to offload and store. The customer went with a sliding door because it could be opened, a pallet of material could be set on the top of the mezzanine deck and then the sliding door could be closed while the pallet was offloaded. With a hinged gate they would have needed to pull the pallet away from the opening to close the open fall hazard, but that wasn’t going to be feasible due to the bar grating decking. This customer opted for a simple keyed entry on the hinge door, but they could have used a push button or key card lock with electric strike as well. 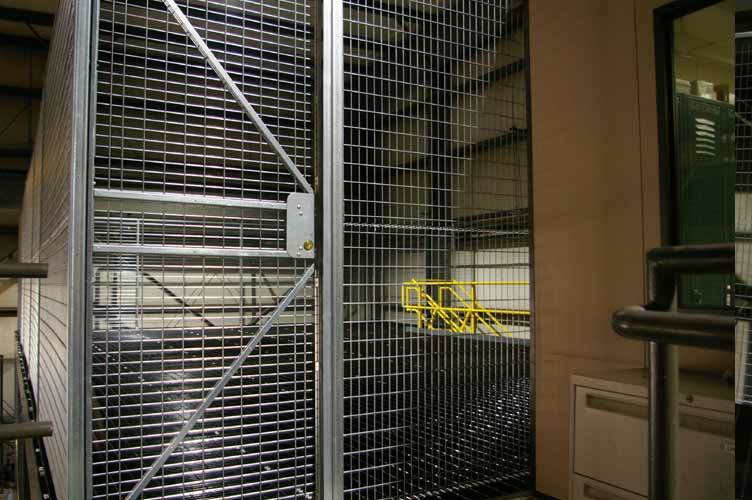 Ultimately, they were able to have secure storage for their maintenance department while keeping their product storage below, at a price that fit their budget. 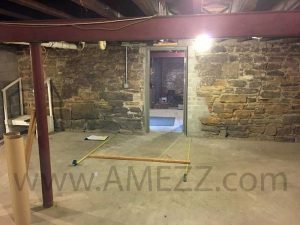 This entry was posted in mezzanines, wire partition and tagged maintenance, mezzanine, stairs, Wire partition on June 19, 2014 by Brett.